I finished up the cabled hat I started last week. I knit it in Peace Fleece Oatmeal so it would be unisex and go with everything. I also know that, in this house, if I knit a hat, it will end up in the hat basket and everyone but me will get to wear it. 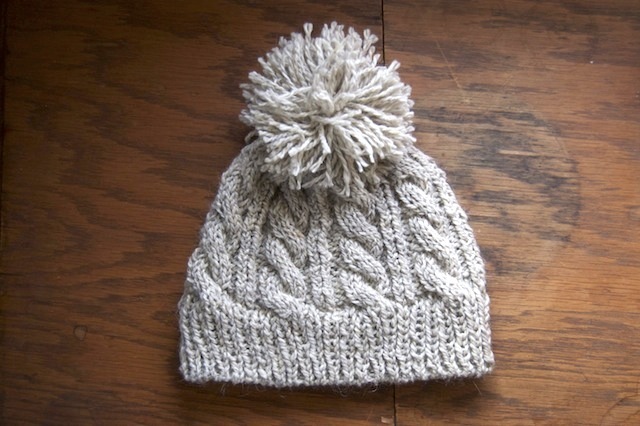 I adore the cables, twisted knit stitches, and especially the pom pom. I really love a pom pom. I tried it on Luke (because he's my go to knitting model who loves everything I make) to make sure it fit (which it did) and do you know what he had the nerve to say to me? "Another hat? How many hats do I need?" Yep, completely deflated by a 7 year old. I decided no one in my house gets to wear this hat. If you'd like to have this fun, cozy hat in your hat basket, I've added it to the shop. I'm moving on to thrummed mittens. No one can complain about not having enough mittens. p.s. I'm joining in with Ginny's Yarn Along.